Sat 24 Aug | Train Charter to cross Angarrack viaduct? Submitted by webmaster on Thu, 12/07/2012 - 14:32. The Duck Race is coming! 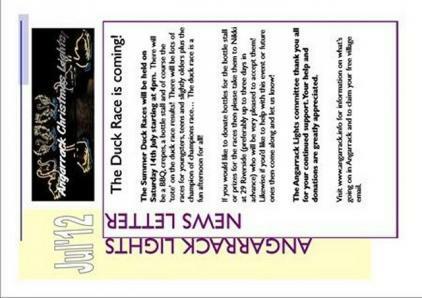 The Summer Duck Races will be held on Saturday 14th July starting at 4pm. There will be a BBQ, crepes, a bottle stall and of course the ‘tote’ on the duck race results! There will be lots of races for youngsters, teens and slightly olders plus the champion of champions race… The duck race is a fun afternoon for all! If you would like to donate bottles for the bottle stall or prizes for the races then please take them to Nikki at 29 Riverside (preferably up to three days in advance) who will be very pleased to accept them! Likewise if you’d like to help with this event or future ones then come along and let us know! The Angarrack Lights committee thank you all for your continued support. Your help and donations are greatly appreciated. Visit www.angarrack.info for information on what’s going on in Angarrack and to claim your free village email.